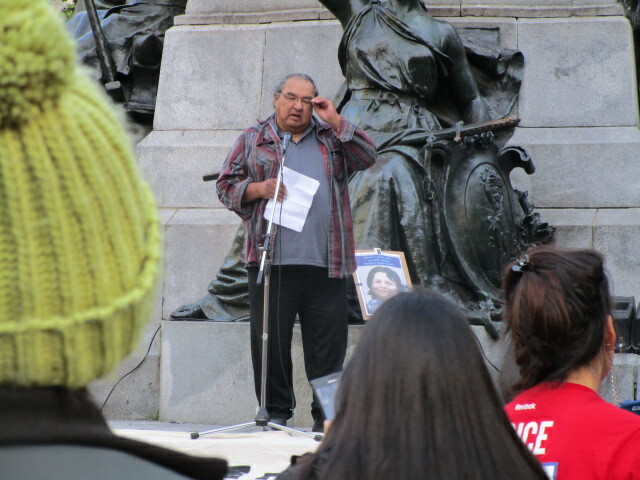 According to the RCMP, there are now 1181 cases of missing and murdered Aboriginal women and girls. 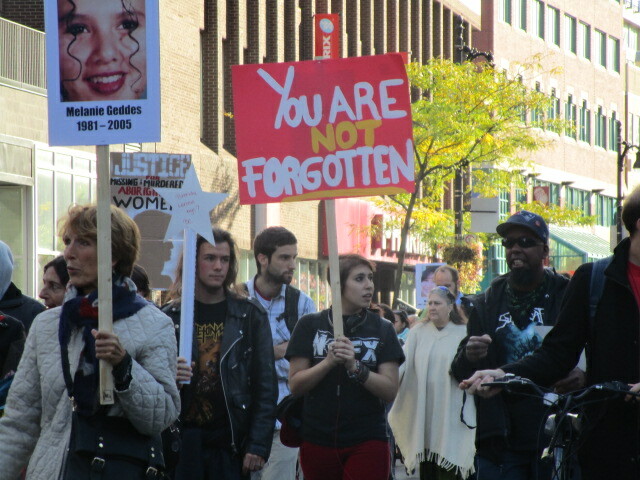 164 are missing and 1017 are homicide victims. 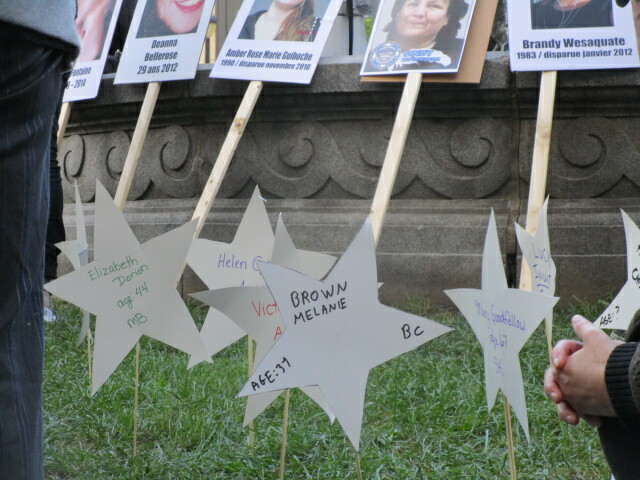 Indigenous activists put the number higher at 3000 missing and murdered women since 1980. 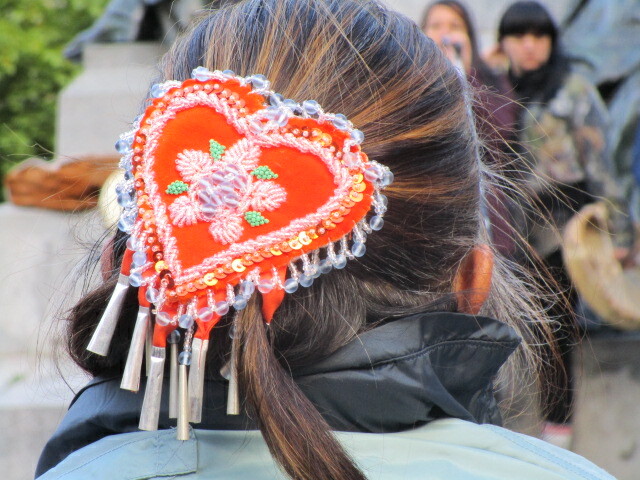 No matter what statistic you use, this number is disproportionately high, as Aboriginal females in Canada are just 4.3% of Canada’s overall population. 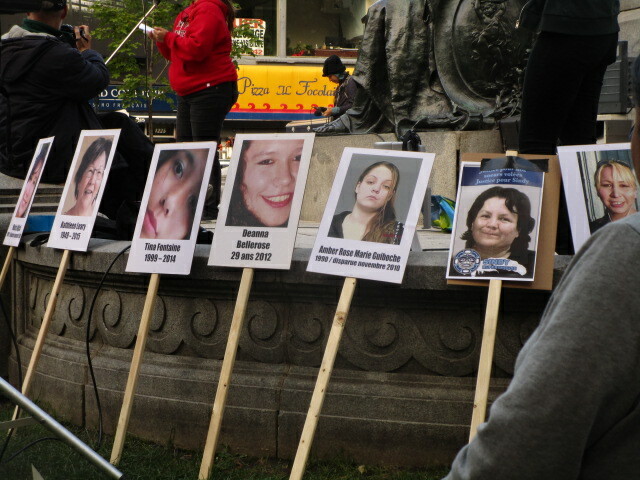 According to the fact sheet on Missing and Murdered Aboriginal Women and Girls from the Native Women’s Association of Canada indicate that 40% of the murder cases remain unsolved. 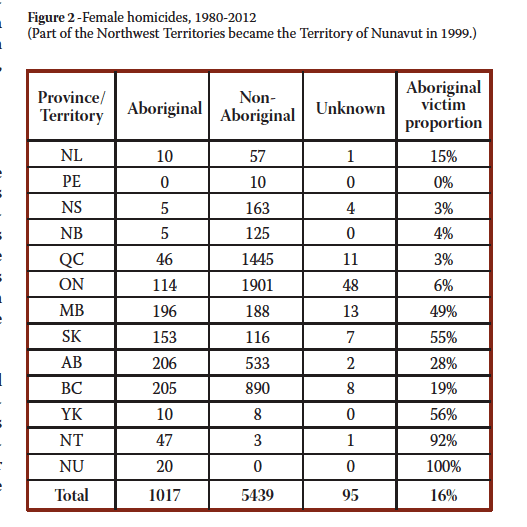 Female Homicides 1980-2012. 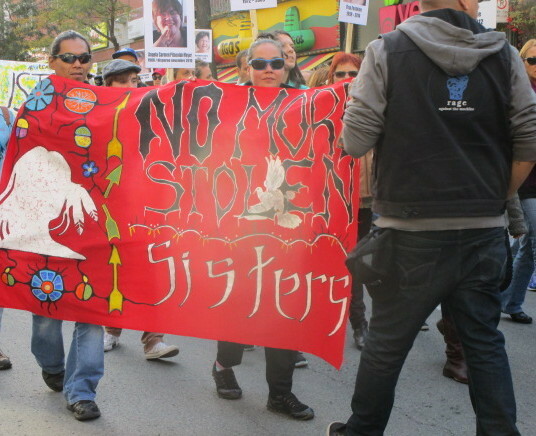 RCMP book on Missing and Murdered Aboriginal Women. 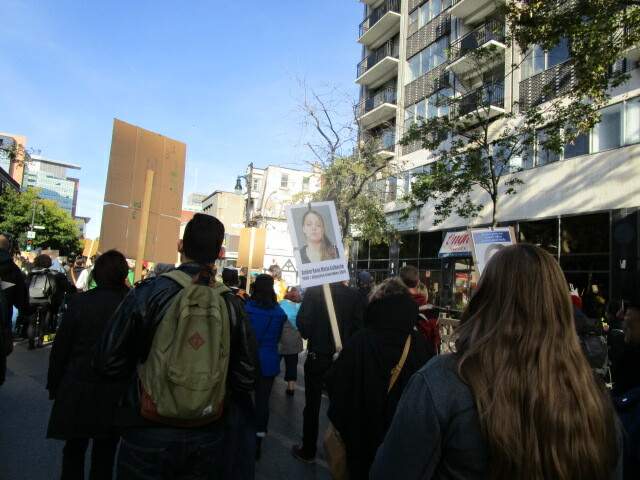 Well Mr. Harper, the issue is high on the radar of the people who showed up to march in Montreal on Sunday as part of the March and Vigil for the Missing and Murdered Women. 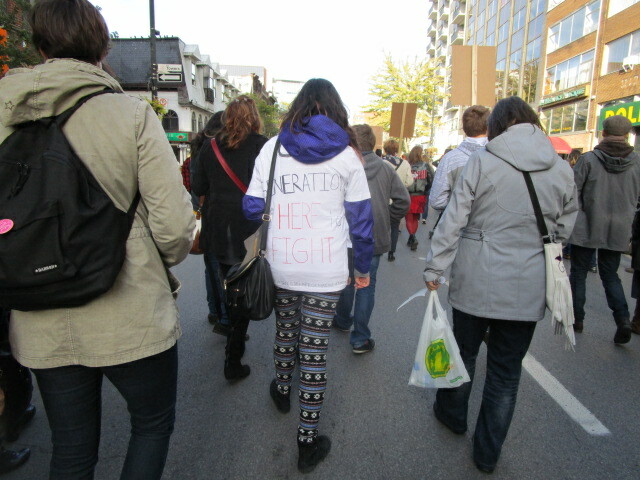 Meeting up at the Atwater metro station, the marchers took off around 4 p.m. down St. Catherine Street towards Philips Square. I was among them. 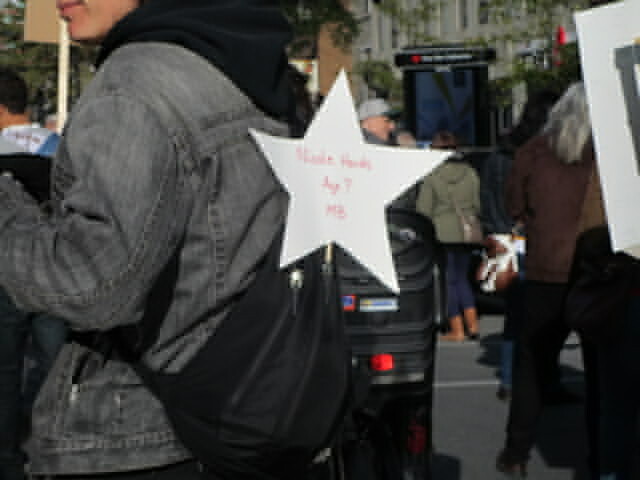 The marchers held banners, posters with the photos of the victims, and paper stars with the names of this crisis’ victims. 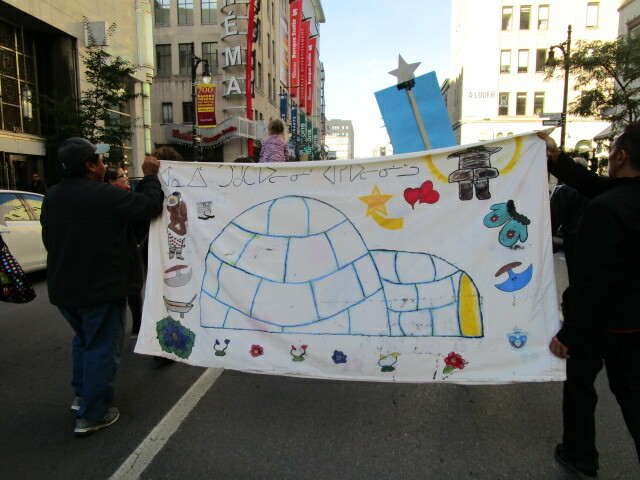 Those marching included young and old, aboriginal and non-aboriginal alike. 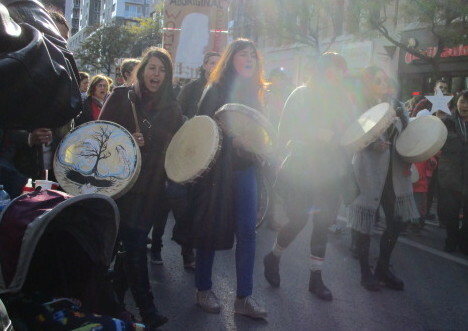 By and large, most marchers were women — but not exclusively so. Crowds gathered to watch and it was probably a valid way for the Sunday shoppers to become more aware of the issue generally. Still, I found it somehow a bit surreal to be walking down Montreal’s avenue of capitalism with stores like La Senza and ads with the scantily clad. Advertising and the fashion industry have no problem dehumanizing women — one of the roots of the problem. 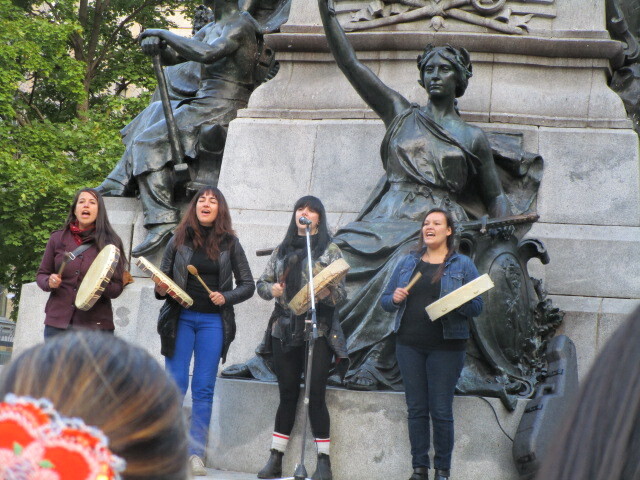 A Montreal is unceded Mohawk territory. 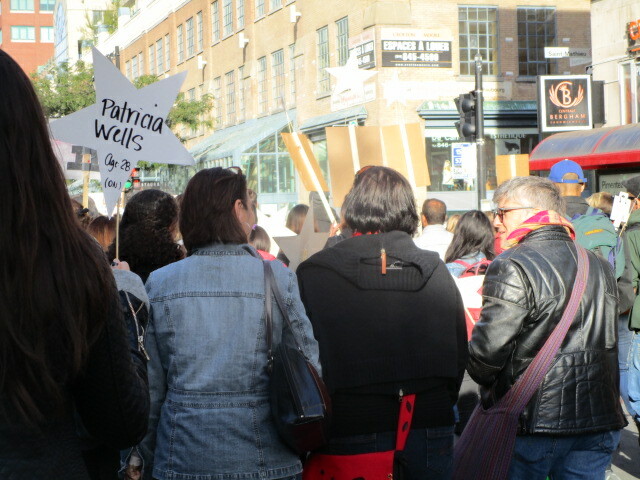 We marchers took about 15-20 minutes to complete the walk and then gathered at Philips Square. 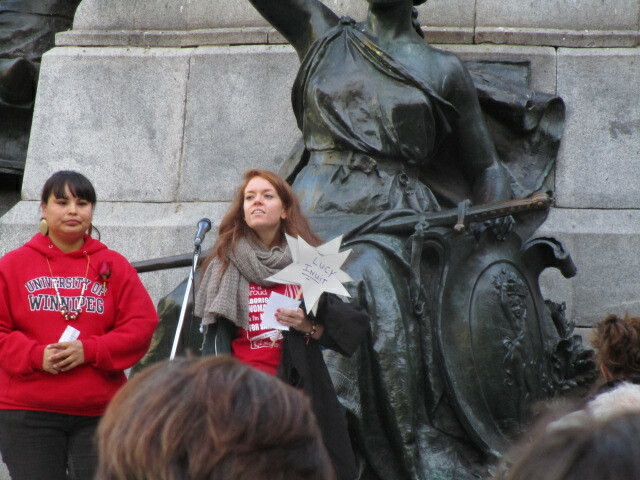 A few had dropped out en route, but there was still a large crowd in Phillips square. Candles were distributed and the firelight shared. 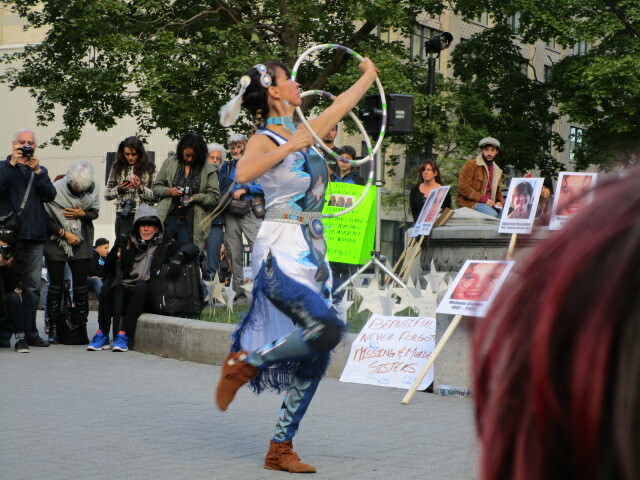 The crowd stood holding the candles while the organizers invited a number of speakers and performers to the stage, including musicians Odaya and the Buffalo Hat Singers with a hoop dancer. 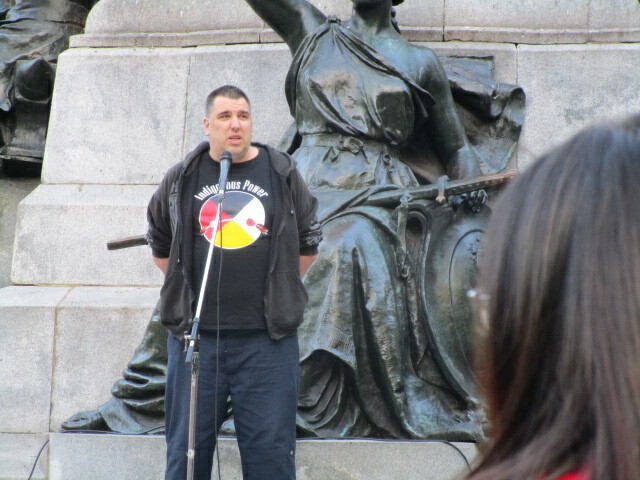 Very moving was Sindy Ruperthouse’s father, Johnny Wylde, who spoke about how his daughter was last seen in Val D’Or. This is the tenth anniversary of the march. Wouldn’t it be great if there was no reason to hold an eleventh? "You’ll think differently once you see how big and sharp my pen is."